Rocket media player is classified as adware application, because it is very common that this program displays annoying commercial ads. It is obviously not the main reason why the application was developed, but Rocket media player can be easily exploited by cyber crooks to promote their corrupted content. You are strongly advised to remove Rocket media player from your computer, especially if you did not want to have the program in the first place. Uninstall Rocket media player and then terminate all the other applications that might be related to this program. Do all you can to protect your computer from harm. 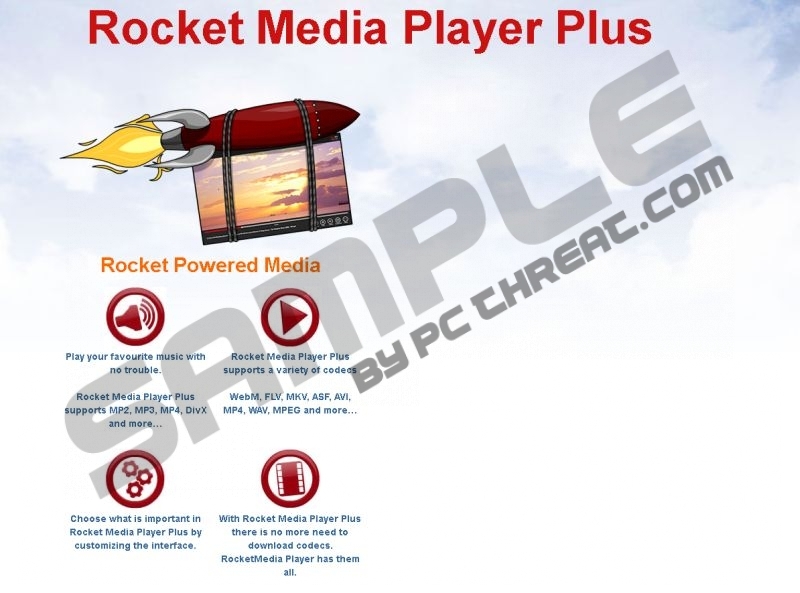 There are two official websites for Rocket media player that can be accessed at rocketmediaplayer.com and rocket-media.co. Obviously, these websites promote and distribute Rocket media player, as their direct download links work perfectly. This player is promoted as a user-friendly application that supports a number of popular media formats, supports dozens of codecs (enabling it to play various videos), can be easily customized and with all the codecs already included in Rocket media player’s setup; you will no longer need to download any. According to our security research, Rocket media player is a legitimate application, but why then is it commonly associated with adware? The problem is that Rocket media player can also be bundled with freeware. There are a lot of websites that distribute third party applications, and these setup files or the website’s installers are full of additional applications that get installed on target computers without even notifying users about it. It is definitely a very suspicious practice (although it is not illegal), and unless you are attentive enough, you might end up with the likes of Rocket media player on your computer whether you want it or not. If you happen to have Rocket media player installed together with other freeware applications, there is a high chance that it will be impossible to remove Rocket media player via Control Panel. In that case, you will need to rely on a licensed antimalware tool, but even if you download the application from its official source, it is very likely that you will automatically install SavingsBull on your computer as well. This adware application is known to be bundled with Rocket media player, and with SavingsBull on your computer you will be bound to see a lot of coupons and discount offers flooding your browser whenever you access an online shopping website. Constant exposure to commercial advertisements can lead to various security risks, so you should terminate Rocket media player and SavingsBull right now. Follow the instructions below to uninstall the applications and then please scan your computer with a powerful antimalware tool to make sure that all the unwanted applications have been removed for good. If you have any further questions, do not hesitate to ask by leaving us a comment. Open Uninstall a program and remove Rocket media player & SavingsBull Filter. Go to Uninstall a program and remove Rocket media player & SavingsBull Filter. Uninstall Rocket media player with SavingsBull Filter. Quick & tested solution for Rocket media player removal.